The Maverick Boat Co. has been revamping the Cobia family/fishing open boat fleet since acquiring the brand in 2005. The Maverick Boat Co. expanded the Cobia family/fishing center console fleet with the addition of a new flagship —the Cobia 344 CC. The boat can pack in the passengers —and supplies ample seating and storage for those passengers, as you’ll see in the slideshow below. I was able to fish the boat off of Fort Pierce, Fla., for a full morning as part of a Maverick media event last week on Hutchinson Island, Fla., on the east coast of the Sunshine State. The Maverick Boat Co. has been juicing up the Cobia brand since acquiring it in 2005 from Yamaha Motors. In fact, Maverick has revamped the entire fleet. There’s not a single boat left of the former Cobia boats. The Cobia fleet includes seven center consoles from 17 to 34 feet as well as a 21-foot bay boat and two dual console models of 22 and 18 feet. In addition to Cobia, the Fort Pierce, Fla., company builds Pathfinder, Maverick and Hewes boats. With four different brands, Maverick covers a wide range of uses for different types of boaters with various buying capacities. 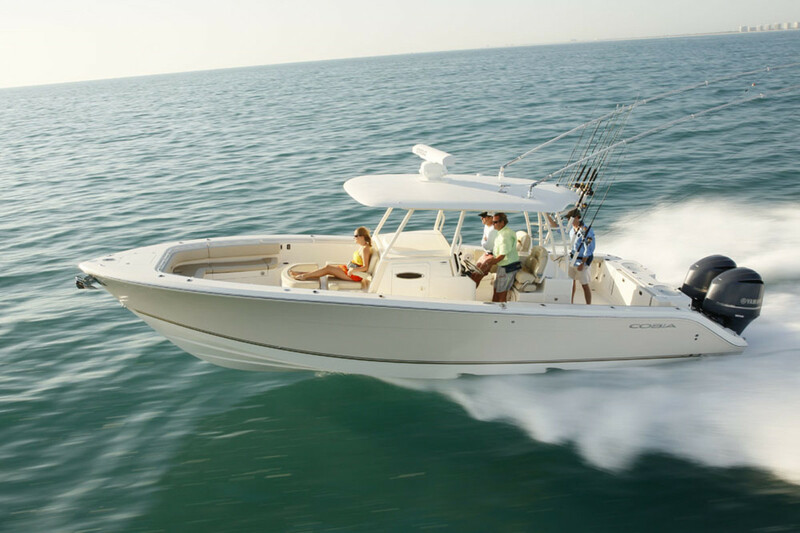 Back to the Cobia 344 CC: Its big hardtop provides great weather protection and there’s an honorable list of standard fishing features with the ability to outfit her like a tournament-ready craft. Ours was close to it, with outriggers, double live wells at the stern and rod holders galore. This monster center console retails for $219,299 with twin Yamaha F350s or $250,294 with triple F300s. “We think there is no better value for the dollar —it’s a ‘screamin’deal,’” Maverick director of marketing Charlie Johnson said. The boat rides on a deep-vee double-stepped hull. She can be powered with twin 350s or triple 300s. I tested the 344 CC with the latter. The boat chomps through a 2- to 3-foot chop, and even with five guys on board there was plenty of room to move around.